After 15 years of teaching English as a Foreign Language it's time I took more of a role teaching and training other teachers. 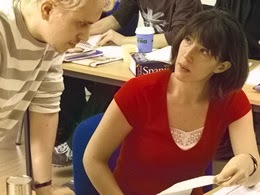 Although I have presented at conferences and seminars for many years and taught occasional input sessions for Cambridge CELTA courses I've never done a whole training course myself. Last Saturday I attended a short training course and interview which included a 10 minute presentation. I'm hopeful that the outcome is that I run training course for one or two weekends each month. It's for a company that run introductory courses for those wishing to become TEFL teachers. They are 120 hour courses with 20 hours face to face (me I hope) and the remaining 100 hours online. I will know on Monday if I've been selected. Watch this space. Interesting stuff, Ian. I wouldn't mind training up to teach the CELTA myself. Any idea who's best to contact? I've taught a couple of TEFL courses here in Thailand, but they're nowhere near as stringent as the CELTA or Trinity. TEFL is mainly for gap year students wanting to teach in Thai state schools for a year.